This model is part of our newly redesigned product line. For over 47 years, Crest ultrasonic technology has been used successfully in industrial and biomedical cleaning systems. That same high-performance technology has been transferred to the Crest Powersonic line of benchtop cleaners. Ceramically Enhanced Industrial Transducers, provide greater cleaning power and reliability compared to conventional wafer type transducers. The driving force is the power source. Crest has brought the superior performance of full-wave 45 kHz Ceramically Enhanced Industrial Transducers to the Benchtop line. If you compare other benchtop cleaners, be sure to compare features... Because there really is no comparison. A perfect cleaner for all tattoo, piercing, jewelry, car parts, hobby, watch repair and dental cleaning applications. We are an Authorized Crest Distributor and are licensed in the state of North Dakota. We carry the entire line of Crest cleaners and accessories. FEATURES: - Precise control of time, heat, power and degas on digital units. Digital model with timer, heat, power control and degas feature - Adjustable, thermostatically controlled heaters (ambient to 80°C). Constant Power - Drains with flow control valve for easy cleaning and rinsing - Main on/off switch. (Booted / Water protected power button) - Analog model with timer - All timers have continuous-operation capabilities. Side mounted handles for easy lifting - Cover included with all units. All stainless steel enclosures resist damage from chemical spills and will not crack. Sweep frequency 45 kHz - 47 kHz. Crest's exclusive Powersonic feature ensures uniform cleaning throughout the tank by sweeping the ultrasonic frequency 3 kHz, creating overlapping ultrasonic waves. This eliminates inconsistent cleaning due to hot spots (areas of intense ultrasonic activity) in the cleaning solution, caused by the unvarying or "standing" waves produced by conventional ultrasonic power supplies. When ultrasonic energy is introduced into a cleaning solution, cavitation, the foundation of ultrasonic cleaning, occurs. Ultrasonic energy causes alternating patterns of low and high pressure phases. During the low pressure phases, bubbles, or vacuum cavities, form. In the subsequent high pressure phases, these bubbles implode violently. Cavitation provides an intense scrubbing action that leads to unsurpassed cleaning speed and consistency when compared with simple soaking or immersion with agitation. Additionally, the bubbles are small enough to penetrate even microscopic crevices, cleaning them thoroughly and consistently. As a result, ultrasonic cleaning is one of the most highly effective and efficient methods you can use for cleaning a wide array of parts. Shane Balkowitsch, RN Balkowitsch Enterprises, Inc. We are available to assist you 24 hours a day, 7 days a week, 365 days a year. You have our word that we will do everything we can for you. We always respond quickly and thank you again for your business. It may take a 7-10 days until your item leaves our international warehouse in route to your location. 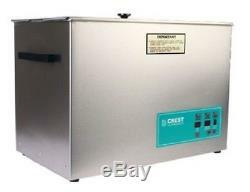 The item "NEW Crest 5 Gallon CP1800D Digital Heated Ultrasonic Cleaner" is in sale since Friday, February 8, 2019. This item is in the category "Business & Industrial\Cleaning & Janitorial Supplies\Other Cleaning Supplies". The seller is "balkowitsch" and is located in Bismarck, North Dakota. This item can be shipped worldwide.